Extra Large Kozy Mittens will fit most large to extra large hands are channeled top and bottom providing moist heat or cold to the entire hand and up to the wrist .The Kozy Mittens warmed from the microwave will help relieve the pain associated with Rheumatoid Arthritis,RA, Reynolds Syndrome, relax stiff muscles, aid with circulation and flexibility. As an cold pack the Mittens will help reduce swelling and ease pain. Simple, quick and easy to use! For a pair of mittens just microwave on high 1 to 2 min., for a single mitt 45 sec, to 1 min, should do the trick. Adjust heating as needed 30 sec, more or less. For cold mittens should be stored in a closed container (a plastic bag is fine ) and stored in the freezer. The freezer adds a little moister so when heated the mitts will have a moist feel to them but you may mist with water before heating to get the desired level of moist heat. A single mitt weights about 1.8 pounds. The weight helps deliver a penetrating deep heat effect. The heat lasts about 10 - 15 minutes, and if you would like the heat to say warmer longer we recommend that once they are on your hands you simply warp a hand towel or like around the mittens proving insulation. 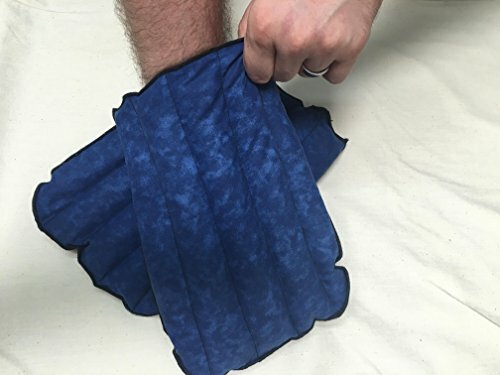 Can be used with paraffin dips (plastic bag on my hand after dip in hot wax) BUT a lot of costumers tell us that these mitts are so nice and toasty that they can use them without the mess and extra work of the dip.